By the way … Alcohol, by itself, causes fat to build up in the liver, exacerbating the effect of a fatty diet. 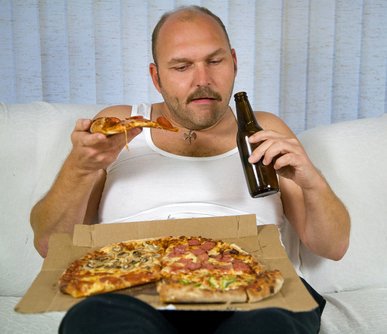 Pizza and beer are not your friends if you want to avoid diabetes. Below is your type 2 diabetes cheat sheet. Refer to this whenever someone asks you why you are reducing your fat intake (and not your carbohydrate intake) to avoid diabetes. I’ve written for years about how dietary fat increases risk for type 2 diabetes. Here’s one from a couple years ago: Mechanism By Which Dietary Fat Can Raise Blood Glucose And Insulin. This is not new. But still … When people first recognize their blood sugar is high, they start eating less sugar/starch/carbohydrate. Even their doctors, who aren’t very educated in nutrition, tell them to do that. It causes them to eat more fat, which only makes the situation worse. Both prediabetes and type 2 diabetes are caused by insulin resistance. Fat makes our muscles insulin resistant, both the fat we eat and the fat we wear. Animal fats (saturated fats) are especially deleterious with respect to insulin insensitivity. Pancreas pumps out more insulin, trying to overcome insulin resistance in muscles. High insulin leads to accumulation of fat in liver, making liver insulin resistant. Liver, which is supposed to release glucose into blood between meals, now starts releasing it all the time because it’s resistant to the message from insulin telling it to stop. Pancreas pumps out even more insulin, making liver even fattier, in a vicious cycle. Fatty liver dumps fat into bloodstream causing pancreas to accumulate fat. Insulin-producing cells in pancreas die as fat accumulates there. This entry was posted in Uncategorized on May 29, 2016 by Bix.